"Is this a tour we should be skipping?" Amazon. The big daddy of online retail and not really a place where I would think that gaming could be a big thing. To knowledge this is the powerhouse’s first foray into console games... I wish to everything good that they hadn’t bothered their backside. 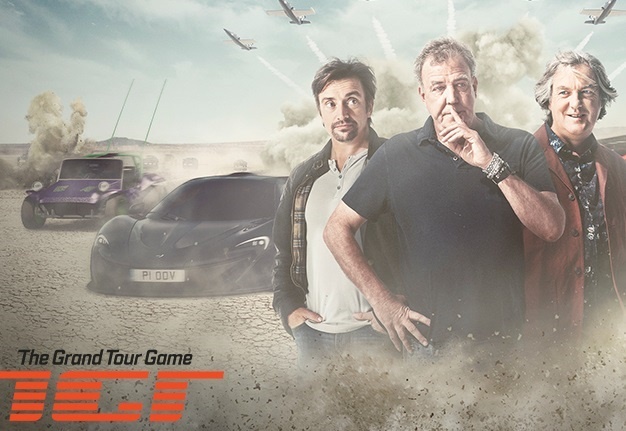 All I can say to The Grand Tour is that if you ever want to see how to alienate people from your brand by turning a game into an interactive TV series. Oh, and you get to pay £12 for the effort. ...it isn’t. This is a shallow excuse for a video game. 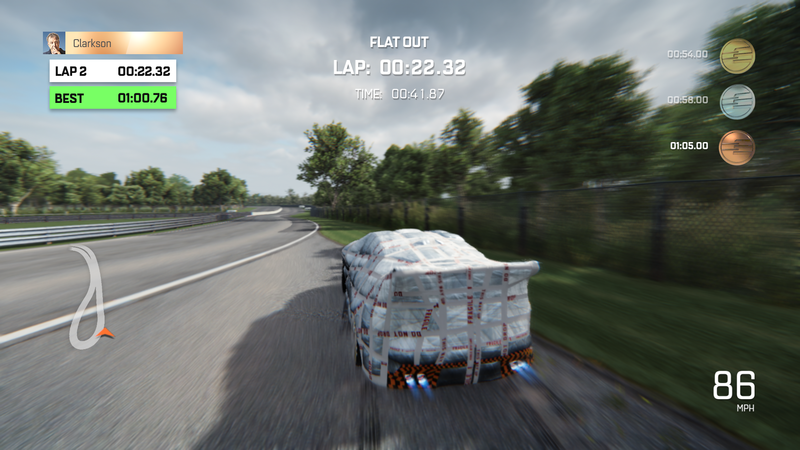 It feels like about 40% of it is a quick time event and the other 60% has you playing a broken version of the first Criterion made Need for Speed. The drag racing is pointless, the drifting you can cheat on and the racing is just a nightmare and only ever has three cars in it, containing the three presenters. I have no doubt it will have more entertaining vehicles as things go on for series 3, but I won’t be around long enough on my console to find out. The biggest shame about all this is that the graphics are actually decent. They’re certainly not the worst I’ve ever seen and the cars do look reassuringly nice. The scenery as well is nice to look at, but none of it matters a damn when the game is so broken and shambolic. I keep calling it a game and I really shouldn’t. Don’t get me wrong the visuals do a good job of blending in with the video, as the show continues on almost seamlessly. I just wish that it was fun to play. Start the section, get your directions from Mr Willman, try excruciatingly hard not to fail. The sound isn’t too bad. You can’t really muck up the video of the actual show, so you will get whatever was broadcast. When the actual game comes into play however, you get a basic tune to accompany the engine noises. The thing is though, you’ve got that part done so fast that it just goes back into the footage again. Don’t even get me started on the difficulty. You’ll find one part of the whole episode that you can’t get gold straight away. The rest of it goes into the piece of cake section of gaming and you could pretty get the whole thing done in an afternoon. I’m not even kidding. You can fast forward the show and play the game part in less time than an episode would actually be. It is a bleeding joke. It is just such a shame that I can’t swear on this review because I would be tearing it a new one at whatever chance I could get. I’d rather play FIFA 06 instead of revisiting this junk again, especially when you can just fly through it. The time to money ratio doesn’t work. I mean, why would you spend £12 on this tripe when you could buy so many better games for just a few pounds more? Dead Cells is epic and has so much more lasting brilliance. Even Burnout Paradise Remastered has been cheaper than this and would be a much better option when you consider how much you get in it. Easy. Push the fast-forward button 10 times and you get one. Hit rewind 10 times and you’ll get another one. You’ll have another 4 or 5 done by the time the show is done, so if you get off on the noise of achievements, you may be buzzing for a while. The game has some severe licensing issues, that it tries to bypass with tactics like this! If I could score this with a zero, I would. Actually, I AM going to score it zero. I can’t pay £12 to watch the whole of series 3 because I need Amazon Prime to get it. I can’t play a long game because there isn’t one and I don’t really want to be playing for less than 20 minutes every time something is downloaded. Amazon should stick to selling and sending games, rather than making them. Virgin did this and they were actually good at it and they crumbled after time. This reeks of nothing more than a cash-in by the powers that be to utilize exactly what is coming out on the TV channel, in the hope that it may give the old boys more cash in their pockets as time goes on. I would rather sit on a broken glass bottle and pick out the shards. It is up there with talentless boy bands and soap operas for me, in that I just deem the whole lot pointless and without reason. If you’re going to take control of a car, make sure it is the one that drives away from this garbage. Less Grand Tour, more irritating school run with a traffic jam.